Hey, it's happened to all of us... You get a great idea and when you try to execute your idea, your resources come up short! That is what happened to me with this week's makeup look. I was going to do a fresh and "springy" look featuring a favorite brand of mineral makeup. Guess what? The colors I selected were CRAP. NO pigmentation, and they were uneven upon application. It's like there was more "filler" ingredients than pigment! Needless to say I went through my collection and threw out more than half of my colors, and have vowed NEVER to purchase from them again. This was the 3rd time I had tried to create a look with this brand and got bad results. Not to mention this brand overcharges for SAMPLES. I'm DONE! So, here is the finished result :-) I added some cute rhinestones for accent. Those can be omitted if you desire. Thank you so much for visiting! I truly love it when you do! amazing makeup! love the colours! 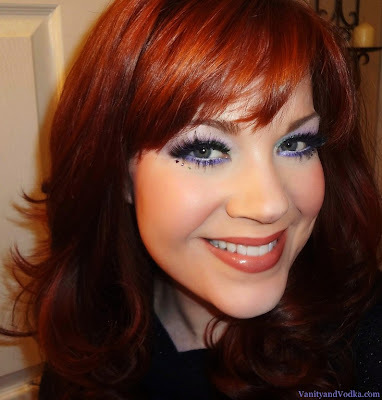 <3 lovely as usual Colleen!Those lashes look just amazing on you. The soft shimmery colors are beautiful & the little rhinestones look so cute! really diggin' that lip color on you too, looks pretty! beautiful makeup and absolutely gorgeous eyes! I'm following you. I really hope you to the same! Love this looks Colleen! Your blended the colors beautifully! Hi Marina! :-) Thank you so much! Thank you! I love the rhinestones, too!! xoxo! The jewels are such pretty addition. Make up is flawless! Love your look! I mean ... I always love your looks :) Amazing! Thank you, Deja! Likewise! xoxo! Thank you, Traci!! YOU TOO!! xoxo! You're welcome! Thank you, Gigi! awe, this is such a beautiful look! i love the combination of colours and how fresh & dewy your face makeup is, love it! I love the colors you used! Now if I could cut my age in half, add twice the talent I might be able to achieve the look you have! Have a great rest of the week! Gorgeous look! Way to turn the tables on the situation! What brand was it? You should share so we don't make the same mistake!! Lovely eyes...and beautiful eye makeup...Am following you colleen. Thank you!! I'd be happy to! Wow you are really good, Will be eagerly waiting for more.